Adorned by the rolling emerald hills of Lexington’s picturesque Bluegrass Country, Lexington Griffin Gate Marriott Resort & Spa offers the perfect blend of seclusion and convenience for an idyllic city escape, situated just minutes away from the vibrant downtown area and numerous must-see attractions. Each spacious guest room boasts wonderful views of the pool and surrounding verdant landscapes, in addition to a host of welcoming amenities including flat-screen TVs, plush furnishings and a marble en-suite bathroom. If you upgrade to a Concierge Level Room or higher, you’ll also delight in a private furnished balcony with stunning views over the breath-taking scenery. 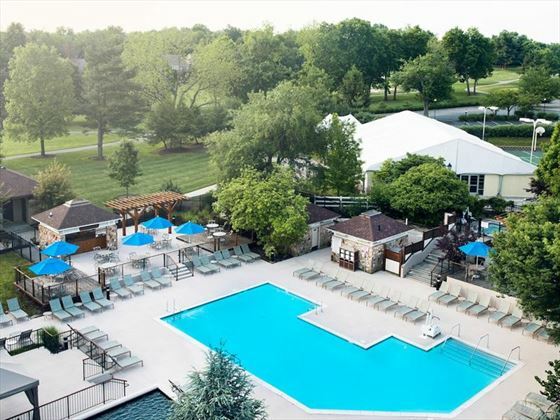 There’s a wealth of fabulous amenities for your enjoyment and relaxation, including a beautiful swimming pool, 18-hole championship golf course and a luxuriant spa. The fully-equipped fitness centre is great for those looking to keep their workout routine in check, whilst the poolside bar is a wonderful spot to unwind with a cocktail and admire the sublime views. The resort’s signature restaurant, JW’s Steakhouse, serves an indulgent selection of flavourful seafood, succulent filets and decadent desserts, whilst the adjoining lounge features a classic list of Kentucky bourbons, light bites and specialty beverages. Between rounds of golf in the warm Kentucky sunshine, 19th Hole offers a scenic setting to enjoy light American cuisine and thirst-quenching drinks. 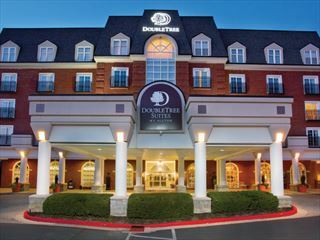 The hotel offers a secluded atmosphere with a convenient proximity to many of Lexington’s famous attractions, including the University of Kentucky, downtown Lexington, Kentucky Horse Park and the Kentucky Bourbon Trail. You’ll stumble upon an endless number of distilleries, museums, gardens and ambient eateries as you wander around this picturesque city, and the downtown area is home to lots of pretty Victorian neighbourhoods too, but we certainly recommend exploring the gorgeous countryside; As you drive along the winding roads and rolling farmland scenery, there is so much to see - stately homes nestled beside famous horse farms, verdant forests framing beautiful towns and plentiful opportunity to explore the breath-taking hiking trails, lakes and national forests. The resort is a 17-minute drive away from Blue Grass Airport, Lexington. Offering 28 square metres of well-appointed, comfortable living space, these rooms feature gorgeous views of the pool and tranquil gardens. Choose from a king-size bed room, sleeping up to three guests, or two queen-size beds, sleeping up to four guests. Airy, modern and spacious, these rooms also span over 28 square metres of private, serene living space with plush furnishings and breath-taking pool views, with the choice of a king-size bed or two queen-size beds; furthermore, guests staying in these rooms will receive exclusive access to the Concierge Lounge and all club privileges. Accommodates three guests in a king room and four guests in a double queen room. Concierge Lounge access with complimentary continental breakfasts, midday snacks and hors d’oruvres, in addition to free non-alcoholic beverages and business services. Featuring 28 square metres of stylish, well-lit living space, these rooms boast stunning views of the breath-taking Kentucky countryside from a small, furnished private balcony accessed through glass-sliding doors. Choose from a king-size bed, sleeping up to three guests, or two queen beds, sleeping up to four guests. Boasting magnificent views of the golf course and surrounding landscapes, these 28 square metre rooms are appointed with gorgeous, contemporary décor and an expansive private balcony to enjoy a picturesque sunrise over the rolling hills in Fayette County. Accommodates up to three guests with a king-size bed. Delight in classic Kentucky-inspired creations prepared with locally-sourced ingredients served all throughout the day, with a focus on succulent steaks cooked to perfection, in addition to delicious appetisers, desserts and a fantastic beverage list. Focusing on classic Kentucky bourbons, this is a great spot to enjoy light bites to eat and a refreshing selection of hand-crafted cocktails and other specialty beverages. A newly-renovated venue set beside the scenic golf course, this is a lovely spot for golfer’s to enjoy light American fare and thirst-quenching beverages before or after a challenging round in the sun. Serving famous specialty coffees, teas and pastries all throughout the day in the hotel’s gift shop, this is a great spot to relax and enjoy complimentary Wi-Fi. An outdoor, seasonal poolside setting serving appetizing snacks and refreshing drinks. Experience the vibrancy of downtown Kentucky at this modern and luxurious hotel. Located in the well-known 4th Street, you'll be enviably close by to great attractions, including shopping and dining at 4th Street Live. Head to Sway for farm-to-fork cuisine, and relax in the indoor pool. A stylish and comfortable hotel offering a wonderful setting in the heart of Lexington, the 'horse capital of the world', each of the 155 rooms and suites boast luxurious deep-soaking whirlpool tubs, complimentary Wi-Fi and plush Sweet Dreams beds. 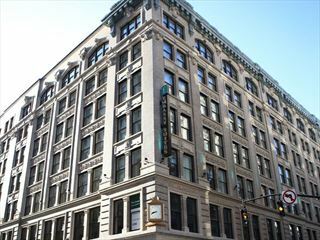 Set in a beautiful, historic building with a charming boutique ambience, Embassy Suites Louisville Downtown is an all-suite hotel boasting a prime location next to the Fourth Street Live! Entertainment District.